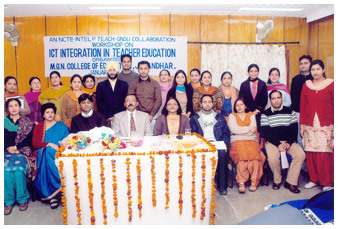 MGN College of Education has established an active Guidance & Counseling cell in year 2010-11 for counseling the students of the college as well as students of schools of the area. Resource persons from different fields deliver talks about career options to pupil-teachers and staff of the college. This knowledge about careers is then disseminated by pupil-teachers in different schools through guidance and career counseling seminars and workshops. a) To create awareness among the students for their future profession. b) To help the teacher trainees in identifying and developing their abilities and interests. 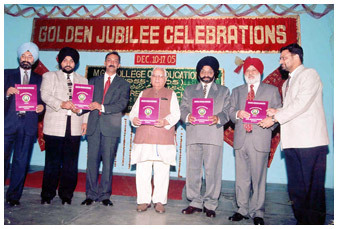 c) To provide guidance to the students on various options available in the courses of their study. d) To provide information to the students on the scope and relevance of any area irrespective of their field of interest. e) To help the students in the development of their self-identity, use of appropriate social skills for interacting with others. f) To provide guidance to develop positive attitude and behaviour in order to meet challenges of life to make it healthier. 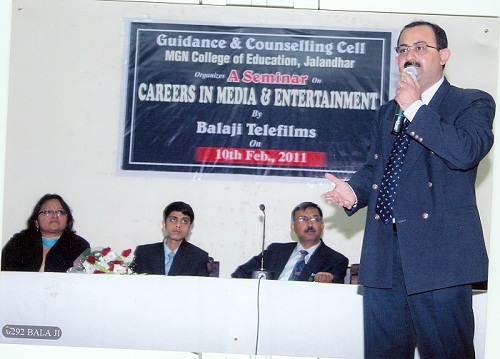 Career and Counseling Cell organized a UGC Sponsored Seminar on “Careers in Media and Entertainment” on 10-Feb-2011 by Balaji Telefilms. On this occasion the Key-Speaker Mr. Piyush Sharma from Institute of Creative Excellence, elaborated on various aspects & skill of Media and Entertainment like acting, production, script writing, visual effects etc. and also gave a career overview in all these fields. The purpose of this seminar was to give exposure to the students about the career prospects in the field of Media and Entertainment and to use media as a tool in teaching-learning process. 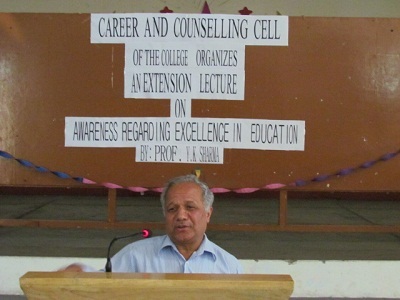 Another Extension Lecture was organized on the topic ‘Awareness regarding Excellence in Education’.On this occasion the Key-Speaker Prof. Y.K. Sharma from H.P. 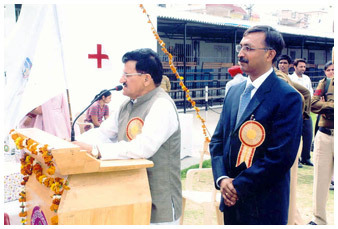 University, Shimla, on 27.04.11 reflected upon the issues of excellence in education in which teacher is the nodal point. he emphasized that for an excellent teacher positive attitude and commitment to the profession is must only then they can get the spark of excellence. 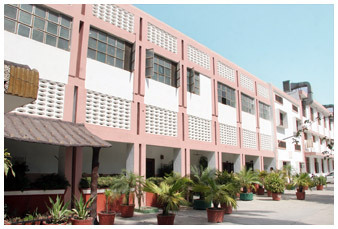 Career & Counseling cell of M.G.N. 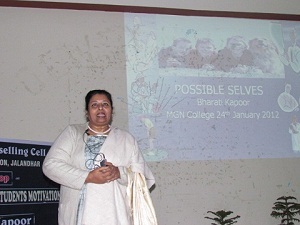 College of Education, Jalandhar organized a workshop on Possible Selves: Nurturing Student Motivation on 24th-Jan-2012. The Resource person for the workshop was Ms. Bharati Kapoor, a renowned Psychologist, Educational consultant and an Executive Director of ODEPQ (Optimizing Development in Emotional and Personality Quotient). This programme is based on Kansas University Invention Model by Michael Hock, Jean Schumaker and Donald Deshler and is adapted by Bharti Kapoor for ODEPQ. The essence of the workshop was that we all know the importance of intrinsic motivation. But very little is done to understand the fears lying beneath the hopes and expectations of students. This workshop aimed to bring to the fore the dreams, hopes and expectations of students and then to help them create a do able action. 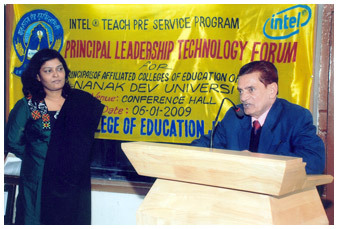 Workshop on “Professional and Soft Skills” was organized by the Career & Counseling Cell on 1-Feb-2012. The Key Speaker of the workshop was Ms.Vandana R., Operation Manager, Mindmaxx. This Workshop was organized in two sessions. The first session was about the essential aspects of Resume making so that the resume get noticed. It was also demonstrated wonderfully by the speaker that how you face and answer the questions asked by the interviewer confidently. Students also came across with the ten tough interview questions and ten great answers. In the second session, it was stressed that personality emphasizes on ability, discipline and success. To develop the personality one should recognize his abilities, possess the art of learning, win over worries and fear. It was also emphasized that in order to succeed in a profession along with good communication skills one must possess soft skills as well. Career and Counseling Cell of M.G.N. 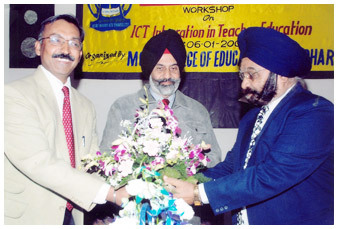 College of Education, Jalandhar organized a Seminar on the topic ‘Positive Health & Nutrition’ on 11-Feb-2012 The Key speaker on this occasion was Dr Balwinder Singh, Gastroenterologist, Joshi Hospital, Jalandhar. In his speech, Dr Balwinder Singh, emphasized that the nature has given us a priceless body, so eat less, work more, do regular exercise, don’t buy disease, stay stress free and you will be healthy and fit.